Ordering Made Easy Legend Grape variety Red White Rosé Sparkling Bottle size Number of bottles in case Aroma Taste Serving temperature 1. Select Your Wines Let yourself be inspired by our detailed descriptions or use your personal wine profile to find out which wines best suit your palate. Our custom chart also features a variety of symbols (explained below) that can guide your selection. Still unsure which wines to order? Opimian’s Wine Concierge is always available to help you make an informed choice. Contact our Wine Concierge at 1-800-361-9421 or by email at Concierge@Opimian.ca. 2. Place Your Order There are five ways to order • Online: Go to Opimian.ca, sign in and select Order Now. • Email MemberService@Opimian.ca with your selection. • Call 1-800-361-9421 • Fax your order to 514-481-9699 • Mail your order* 3. Let Us Handle the Rest The wines featured on this Cellar Offering are still at the producers’ wineries when you order them so it is normal that the process takes a bit of time and effort on our side. Release dates are dependent upon actual arrival dates, distance from port of entry to liquor board and processing time required by each liquor board. For this Cellar Offering, the expected release date is end of August 2019. Once the wine arrives at your local liquor store or distribution centre, you will receive a Pick Up Notice with the specified date (the Release Date) and your pick up location. You can follow the status of your shipment at all times at Opimian.ca. Ideal with Evolution Drink this year Will develop, drink within 2 years Meant for cellaring Concentration Light Medium Great Conditions of Purchase • Accepted payment methods: Credit Card (Visa, MasterCard, American Express) or cheque payable to Opimian. • Prices include all applicable federal and provincial mark ups and taxes. • A valid membership card is required to order and pick up. • Bottle prices are for reference only. All orders are by the case, with no minimum required. 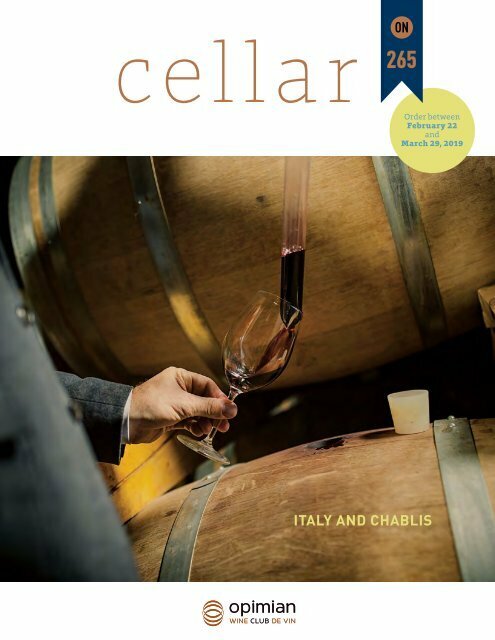 • Last day to order from this Cellar Offering: March 29, 2019. Important: no orders will be processed after this deadline. * Deadline for mailing orders: March 19, 2019. Please allow 10 days for delivery by Canada Post. Oak Light Medium Heavy Limited quantities Limited Very limited Extremely limited Less than 100 cases available M—Degree of Maturity (1-10) M1 = lay down M10 = fully mature Members’ Choice Most ordered by Opimian members Opimian Suggests Starting a cellar Medal Winner Discovery Opimian Discovery 2018 C256 Select Plus Opimian Select Plus 2018 C256 D—Degree of Drinkability (1-10) D1 = needs time D10 = ready to drink Sweetness scale Grams/litre Examples  0 - 3 Chardonnay, Sauvignon Blanc, many reds  4 - 6 Some New World varietals, some reds  7 - 12 Champagne, Sparkling, Rosés, few reds  13 - 20 Mosel, some Alsace, Anjou  21 - 34 Semi-sweet Bordeaux, some sherry  35 - 50 Kabinett German, Late Harvest, Alsace  51 - 74 Spätlese German, Sweet Loire, Port, Dessert Muscat  75 - 100 Auslese, Beerenauslese  101 - 139 Icewines, Sauternes, Barsac, dessert wines, Port  140 - 179 Icewines, Sauternes, Barsac, dessert wines, Port  180 > Speciality sweet wines, Trockenbeerenauslese 2 Cellar 265 — ontario cover — At Montigoli, the maturation of the Valpolicella is done with great care and passion. Winemaking technique is the best guarantee to obtain the finest quality.